Editor's note: We’re jumping into our Delorean to explore how some of our favorite historical figures might have worked with Google Apps. Today, on the anniversary of Isaac Newton’s knighthood, we imagine his research in a Google Apps universe. In April 1705, Isaac Newton was knighted for his many accomplishments. Since we’re self-admitted history nerds (how better to appreciate the advancements we enjoy now?) we asked ourselves: what if the Isaac Newton of 1705 used today’s Google Apps? Newton was one of history’s foremost masters of mathematical formulation. What if he had been able to archive and automate his complex formulas in Sheets? We imagine he might have used the product function, =PRODUCT(factor1, factor2), to test different values for his second law of motion: force equals mass times acceleration (f = ma) — showing how apples of different sizes fall with different rates of acceleration from a tree. While writing his famous Principia, Newton might have solicited feedback from his colleagues, like mathematicians Isaac Barrow and John Collins, by creating a Google Group and inviting them to edit in Docs. Working in Docs would have been helpful for keeping track of his notes while developing calculus — it might even have helped to avoid a heated debate with Gottfried Wilhelm Leibniz, who claimed he discovered it first. There’s no dispute over who first documents an idea when there’s access to revision history. Newton famously feared criticism and was no stranger to controversy, so we imagine he would have been a strong advocate of using technology to keep his research secure. Should he have any concerns about a collaborator secretly passing sensitive information to his rival, Robert Hooke, he could adjust the sharing settings. He could even restrict the ability to view, share, download or print his treatise on optics after he’d already shared it. Newton communicated through writing by hand — it’s estimated that he left behind about 10 million words of notes, letters and manuscripts — but we think he might have used Hangouts for urgent conversations. 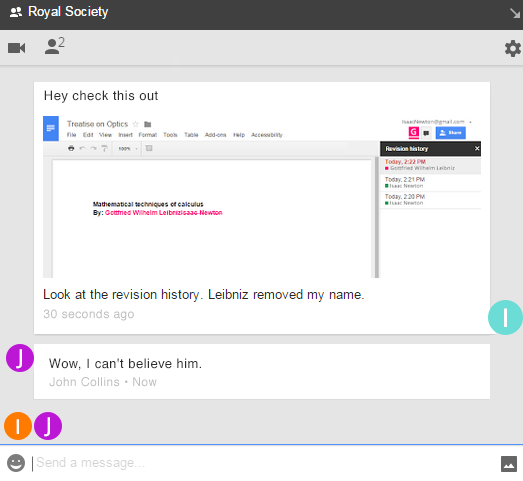 If Newton needed to speak with his colleagues at the Royal Society about whether Leibniz was guilty of plagiarism, he’d meet with them face-to-face on a Hangout. Or, if his wig wasn’t looking particularly great that day, he could’ve started a group chat and shared pictures of his calculus notation as evidence (maybe even including a few emoji to lighten things up). As a professor at the University of Cambridge, Newton lectured about optics and presented his research about the properties of light. He might have shared illustrations of prisms to explain rainbows and the color spectrum, uploading the images to a shared Drive folder rather than passing around delicate hand-drawn sketches. Using Drive’s Optical Character Recognition, he could turn his handwritten notes into searchable text. Old notes he wrote on refraction and diffraction would be easy to find and reference as he developed new theories on the nature of light. As one of the most important thinkers and scientists of all time, how valuable would it have been for him to so easily archive and pull up his every great thought and idea? Sir Isaac Newton’s findings changed our understanding of the world around us and are still relevant to our lives 300 years later. But even more inspiring is the way his curiosity and intellectual daring influenced generations of thinkers to be relentless in pursuing new ideas — a principle (pun intended) that drives us here at Google.